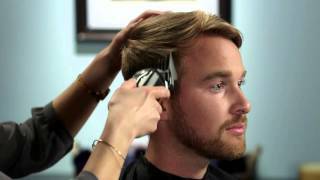 The Close Cut is the cleanest look of them all and it’s a style that you can do on your own. Upkeep should be part of your regular routine and it’s easy to do with Wahl clippers. Use your Wahl clipper with the taper level at its closet position. Using an upward, rocking motion, cut the sides and back of the head, rotating the clipper head as you change sides. Use careful, fluent strokes and a mirror as your guide. Now focus on the top of the head, running the clipper in smooth, straight strokes from front to back. Run the clipper over the same spots, if necessary. Finally, use your shaver to completely shave the head. Use a mirror to check for missed spots. Repeat the process every few days.